Boeing says two undisclosed airlines have reached agreements to buy a total of 15 787-9 Dreamliners valued at $4.2 billion per current list prices, on Thursday at the 2018 Farnborough International Airshow. One of the airlines would become a new 787 customer. 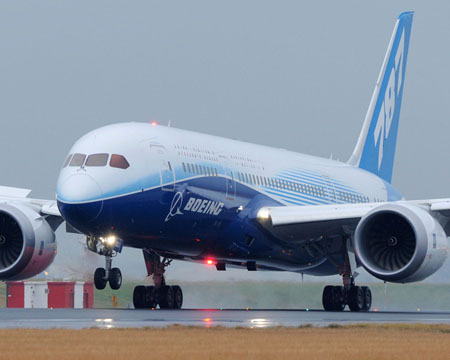 The second airline is adding more 787s to their Dreamliner fleet. Both 'commitments' will be reflected on Boeing's Orders and Deliveries website once when and if they are finalized. "This is the Dreamliner effect. New airline customers are drawn to the potential for greater fuel efficiency and range and super passenger amenities, while existing customers have experienced all of these advantages first hand and want to grow their fleet with more 787 Dreamliners," said Ihssane Mounir, senior vice president of Commercial Sales and Marketing for The Boeing Company. "The strong market preference for the 787 is securing its status as the fastest-selling widebody aeroplane in history." Hawaiian Airlines finalised its order yesterday for 10 787-9 Dreamliners, included purchase rights for 10 additional 787s although the deal was effectively completed back in March after a vast discount had been applied by Boeing to woe the airline away from Airbus aircraft. "The Dreamliner's operational performance and passenger-friendly cabin makes it an ideal aircraft to serve as our flagship aircraft of the future," said Peter Ingram, president and chief executive officer of Hawaiian Airlines, following a script written for him by Boeing.